HD+ launches a multi-screen application for DTH channels. 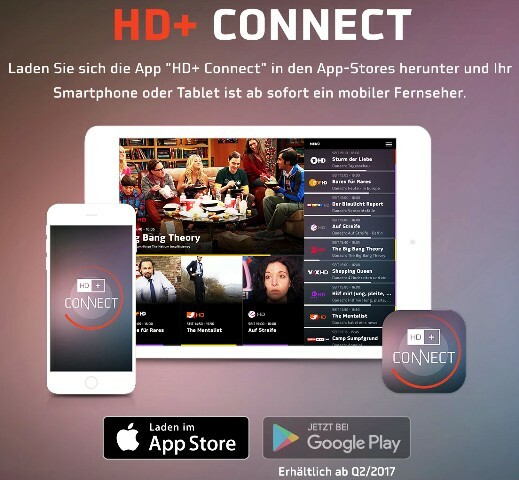 German HDTV platform HD+ launched the HD+ ExtraScreen service that allows satellite DTH HD TV channels to stream directly from satellite TV decoders to smartphones and tablets in HD. To get HD+ ExtraScreen service that announced in November 2016, viewers will need the satellite TV receiver Humax UHD 4tune+ and HD+ Connect application that is currently available for iOS devices through iTunes. An Android version of this HD+ connect app will available on Google Play soon in 2017. The satellite TV decoder distributes the HD channels within the Wi-Fi home network to mobile devices. Unlike previous SAT-IP solutions, with HD+ ExtraScreen, it is technically possible to transmit encoded HD channels on smartphones and tablets for the first time, regardless of the TV channel running on the TV system. The application is free and does not carry advertising; Registration is required to use it. If viewers - in addition to unencrypted HD channels - want to stream HD+ channels on their mobile devices, they must have activated HD+ Smartcard. According to Humax, other manufacturers are also trying to integrate the solution into their decoder that is HD+ using the client IP. With Humax and ExtraScreen HD+ Smartphones can be used as secondary TV in homes. HD+, a subsidiary of the Astra satellite operator SES wants to add other functions of the HD+ Connect application in the future. With the remote control function, viewers can use their smartphone and tablet as a remote control for the TV. Remote recording lets you set up TV recordings when you're on the go.